S.J. Collins Enterprises, the commercial real estate development firm behind The Interlock, has partnered with Slater Hospitality Concepts to create an "unparalleled rooftop experience" at the mixed-use development, according to a press release Tuesday. The Interlock, a $450 million project in the Howell Interlocking Historic District in West Midtown, is under construction. “The opportunity to bring something fresh and new to the west side of Atlanta is very appealing to our team," Mandy Slater, co-owner of Slater Hospitality Concepts, said in the release. Slater Hospitality Concepts is the group behind The Roof at Ponce City Market which includes Skyline Park, 9 Mile Station, and the recently-opened RFD Social. While the forthcoming concept is still in the design phase, elements for the rooftop will include a modern private pool club and lounge with a retractable roof and a 12,000-square-foot two-story restaurant and outdoor bar with covered patio. 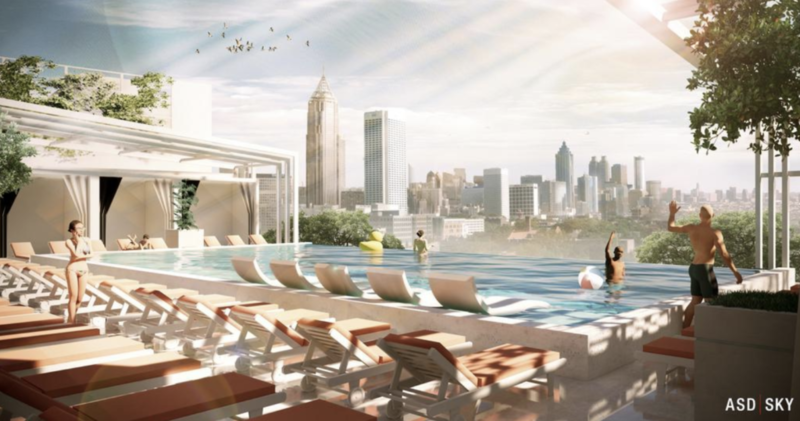 An infinity-edge pool will "drop off into the city skyline." “The goal is to transform this one-acre area in the sky that overlooks the Atlanta skyline at The Interlock into the ultimate rooftop experience,” Jeff Garrison, partner with S.J. Collins Enterprises, said in the release. “We envision this will be the perfect place to grab a drink during happy hour after work or host any events or celebrations,” said Garrison. JLL Atlanta brokered the deal, and ASD | SKY provided the initial renderings and design for the space. Once complete, The Interlock will offer 200,000 square feet of loft office space, 105,000 square feet for retail, 350 apartment units, 70 single-family homes, and a 145-key Marriott Tribute Portfolio hotel.